Looking for a stewardess/companion who loves the ocean with a big heart. Some sailing experience would be nice but not mandatory. I like to work with someone who's easy going and eager to learn. 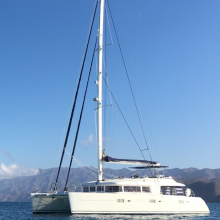 We are a private sailing catamaran and cater to the owners from Texas who come to the boat during the months between November to June. The rest of the time we take care of the boat then go surfing or exploring Baja or Costa Rica depending on where we're at. The boat spends half the year in Cabo and the other half we sail to Costa Rica for the summer where I reside. It will just be myself and one stewardess/crew who will be running the boat unless we sail long distance and I normally hire my delivery crew for these trips to join us.